It is said of writing that “everyone is the hero of their own story,” but in telling that tale, people often reveal much more about themselves than they realize. Much about our experience of the Trump presidency bespeaks sadness. This book is no exception. I’m admitting that I’m an information junkie. I’m so afraid that this political havoc will happen to me and my world and I won’t know enough not to be caught powerless. For that reason, I couldn’t help myself…I had to read it, even though I suspected it was little more than the writings of an opportunist. I found Unhinged tobe a meta-commentary on the bleakness of our political culture by Trump’s former Director of Communication’s for the Office of Public Liaison. It is an illuminating, pathetic response to our political climate – the 2018 tell-all in its purest, saddest form. Whether Manigault Newman is a savvy con artist developing her next act in entertainment or a lost soul helplessly seeking retribution is irrelevant. To me, the author is an elaborate example of how vulnerable disenfranchised people are in this world of ‘haves and have nots’. Omarosa came from the projects. Both her father and her brother were shot and killed. She did not see herself as worthy of respect. She developed a thick skin and a willingness to put up with a lot to get ahead, even if it meant compromising her own values. She was the perfect foil for Donald Trump. Interestingly, I believe that is what makes Trump the perfect foil for Vladimir Putin. 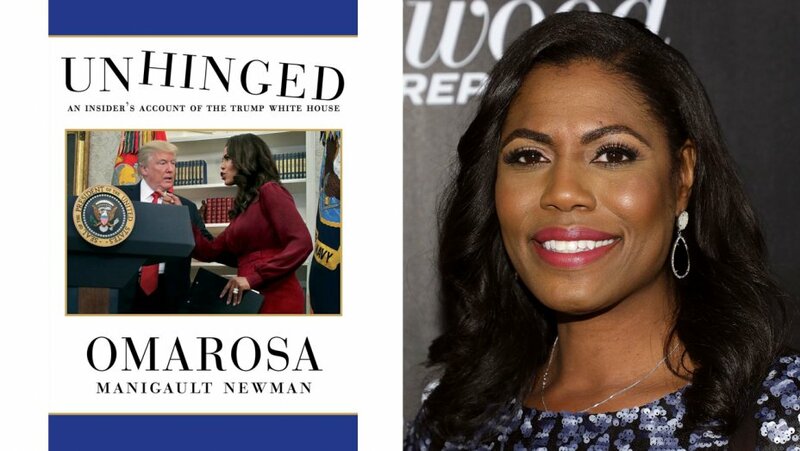 But in her own way her book reveals her complicity, a complicity she herself mentions on her Meet the Pressinterview, but not in this book. .
Omarosa has worked with Donald Trump for 15 years. She has had intimate access to him for all of that time. She knows him. She says that there has been a recent decline in his physical and emotional health, and I believe her. But, when she recounts incidents of racism, dishonesty, etc., she really did nothing about it. Not until she was fired. How unfortunate, for her own sense of self. She is repeatedly “troubled” by Trump’s racially-charged statement. She is “concerned” by the arrival of campaign chief and alt-right guru, Steve Bannon. Disturbed by the “classic dog-whistle racism” in Trump’s acceptance speech, she resolved to tell the candidate that “words matter.” But so far as the reader knows, she never actually does that. She makes a vow to herself to increase diversity in Trumpworld. The book is full of shocking incidents: his daily tanning bed sessions; how he talks about Don Jr.; derision of Kelly Ann Conway and Gen John Kelly, Trump’s chief of staff; Melania’s use of clothes choices as a way to even the score; Mike Pence as the “Stepford Veep” who beatifically gazes up at the president even as he actively yearns to replace him; and the most shocking to me, that he packs a gun! The list is long and in some ways fascinating. There are many opportunities read things that haven’t previously been disclosed…titillating.